Every year during the St. Patrick’s Festival children and adults alike proudly don their national dress but how many know the story behind the costume? Discover Montserrat spoke with Ms Ann Marie Dewar who led the drive to design a national dress as part of the 2002 St Patrick’s Festival Committee. Dewar said the use of Madras came up in the discussion but there wasn’t “much available on island. So I went on a “sample” shopping spree, and I collected samples of madras from a range of shops, in various colours, designs, etc..
“When we launched the search and the designs came in from Montserrat and further afield, a panel of judges selected the top designs. Then the top designers were each given some funds to have their designs made up for a show. The samples of madras I collected were made available, and of course, designers could select their own,” explained Ms Dewar, who is one of the island’s multi-disciplined artists. According to the official report on the national dress search, by the time the competition closed on 31 December 2002, a total of 39 designs (28 for female outfits and 11 for male outfits) were received from Montserratians in the UK, USA, Canada, the Caribbean region, and in Montserrat. “The final competition was a National Dress Search and Cultural Show on 13 March, 2003. During this show, the short-listed designs were constructed and modelled before a panel of judges, who selected the top designs each for male and female wear. 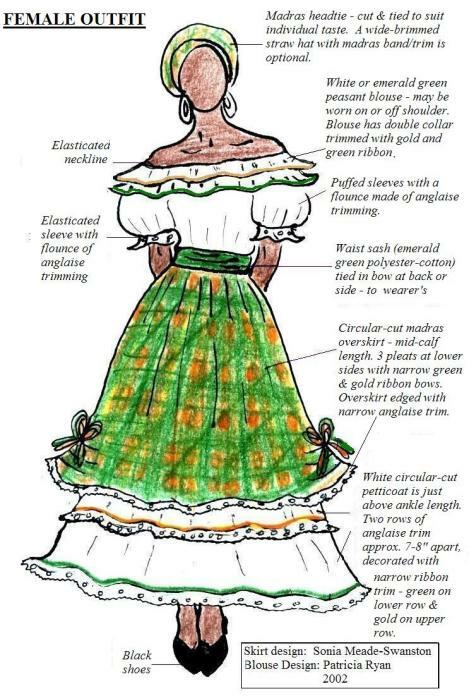 The final designs were formally recommended to Executive Council, and Government formally declared these designs to be the Montserrat National Dress in August 2003,” notes the report. “The Montserrat National Dress is a fusion of past and present, reflecting the history, heritage, and cultural expression of the people of Montserrat, their way of life and sense of style, as well as their desires and aspirations for the future.”The fabrics – polyester-cotton and madras – are light and cool, suitable for the Montserrat climate, and comfortable to wear. Madras was brought to Montserrat and the rest of the Caribbean from India, in very early colonial times, and used to make clothing for the labouring classes. It has remained a popular fabric.”The colours of emerald green, marigold, black and white represent the various contributions of ancestors and settlers to our social and cultural moorings (for example, green, gold, and black – the colours of Africa – reflect the primary ancestry of our people, and influence of our traditions). The basic female outfit features a white petticoat trimmed with anglaise ‘eyelet’ edging and green and marigold narrow ribbon, a madras overskirt, a peasant-style blouse, an emerald-green waist sash, and a head tie. Petticoat: This is circular-cut, and made of white cotton dacron fabric, just above ankle length, and edged with 2 – 2 1⁄2 inch white anglaise ‘eyelet’ trimming. Another row of the anglaise trim is also sewn around the petticoat, about 7-8 inches above the lower row of anglaise trim. (This should be just below mid-calf, and should show about 1” below the edge of the overskirt). A narrow (8-9mm width) ribbon trim is sewn around the upper edge of each row of anglaise trimming – (green on the lower row and marigold on the upper row). The waist is elasticated. Overskirt: This is circular-cut, in an emerald green-marigold-white madras plaid, reaching to around mid-calf. At each side, the overskirt is gathered up from the hem in three small pleats, (so that the sides of the overskirt are approximately knee-length), and trimmed in green and marigold ribbon bows to match the ribbon trim of the petticoat. The overskirt is edged in 1-inch white anglaise trimming. The waist is elasticated. Blouse: This is peasant-style, and is made from either white or emerald green polyester-cotton fabric. The elasticated neckline may be worn on or off the shoulder, and has a two-layered collar (lower layer is 6” long and the upper layer is 4 1⁄2 ” long). On a white blouse, each collar has a single row of narrow (8 – 9 mm width) ribbon sewn about 1⁄4” from the edge – marigold ribbon on the upper collar and emerald green ribbon on the lower collar. Elasticated elbow length puffed sleeves may be worn at the elbow or pushed up on the upper arm. The sleeves are edged with a flounce of white anglaise trimming (approximately 2 – 2 1⁄2 inch width). Accessories: The outfit is completed by a madras head tie, tied to suit the wearer’s preference. A wide-brimmed straw hat (with a madras hatband) may also be worn, along with other accessories made of natural materials such as straw, wood, stones, or seeds. Footwear is black shoes or sandals. 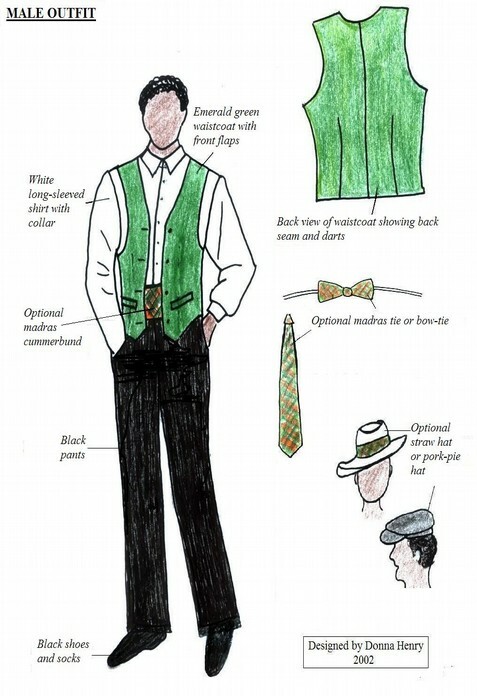 The basic male outfit is a long-sleeved white cotton shirt with collar, worn under a waistcoat of plain emerald green cotton or polyester blend fabric. Trousers are plain black, and a cummerbund in an emerald green-marigold-white madras print is worn around the waist and fastened at the back. Footwear is black socks and shoes. Optional headwear may be a simple straw hat with a madras hatband, or a pork-pie hat. The designs are amazing. Great job! I would like to get an outfit made for myself. I would love some info on how I can go about doing so. Montserrat’s Saint Patrick's Festival - A Commemoration of The 1768 Slave Rebellion - Caribbean & Co.